Sen. Bernie Sanders rallies supporters of his 2020 presidential bid at Great Meadow Park, gesturing at a podium against a backdrop of the Golden Gate Bridge in San Francisco. Sanders completed his California tour this afternoon, after making stops at San Diego and Los Angeles in the past weekend. As Sen. Bernie Sanders (I.-Ver.) 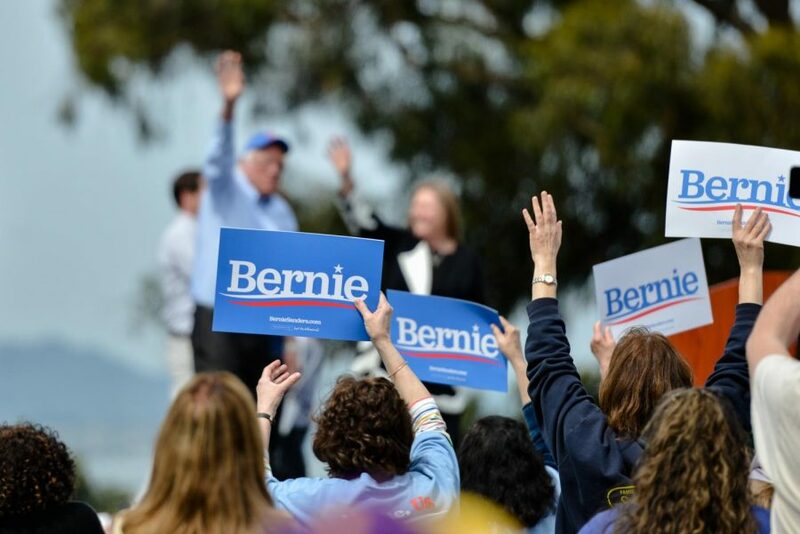 took the stage, followed by his wife and grandchildren, a crowd of thousands gathered in San Francisco’s Great Meadow Park this afternoon cheered and waved their blue and white “Bernie” signs in the air to greet the 2020 presidential primary candidate. “We are going to transform this economy and this government and create a system that works for all of us, not just the one percent,” Sanders said during his speech, followed by another surge of cheers from the audience, which, according to the Bernie Sanders campaign, numbered over 16,000. Sanders announced his bid in February, joining a growing stream of Democratic candidates, including Sen. Elizabeth Warren (D.-Mass. ), Sen. Kamala Harris (D.-Calif.) and former Congressman Beto O’Rourke. 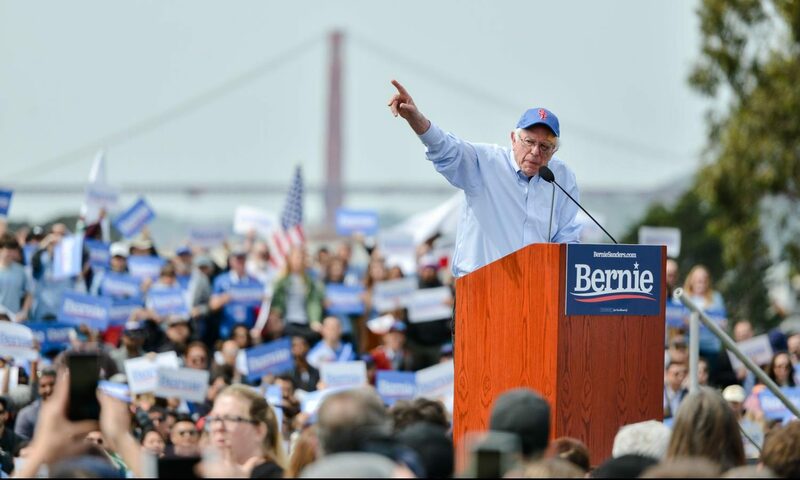 This weekend, he hosted rallies at San Diego and Los Angeles before arriving in San Francisco to complete the inaugural California tour in his 2020 campaign. His self-described democratic socialist platform highlights issues that distinguished his 2016 bid in the presidential primaries from the established Democratic candidates, namely universal healthcare and childcare, a $15 minimum wage, tuition-free public college, voting and campaign reform, abolishment of private prisons, a federal jobs guarantee and other measures that aim to protect citizens against abuses of corporate power. “When we talk about justice, it means that we will no longer sit idly by and allow this country to into an oligarchy form of society where a handful of billionaires control the economic and political life of this nation,” he said at the rally. Sanders’ socialist stance on national issues have previously been deemed “radical” by establishment Democrats and other, more conservative members of the electorate in the past—to which he responded today in an ironic tone, mocking critics of his platform. A supporter greets Sen. Bernie Sanders by holding up a "Bernie" sign at the rally in San Francisco this afternoon. During his speech, Sanders responded to the recently completed investigation by special counsel Robert Mueller into allegations of coordination between Russia and the Trump campaign in 2016. Moments before Sanders’ speech, major news organizations such as The New York Times reported that Attorney General William Barr, to whom Mueller’s full report was submitted, delivered a summary of the report and declared that no conspiracy was found between the Trump campaign and Russia. Sanders opened his speech today with a call for “the whole damn report” to be released. “Nobody, especially this president, is above the law,” he said. Today’s rally also featured performances by singer-songwriter Sarah Lee Guthrie and the band Tony! Toni! Toné!, as well as San Francisco Democratic Party Chair David Campos, Rep. Ro Khanna (D.) and Ohio state Sen. Nina Turner (D.), among others.